One in a while, when we see something anew, we can have an aha moment—a paradigm shift of sorts. These creatively engineered parts are all part of a fixture assembly that a clever engineer designed once he understood what kind of cutting a tube laser could do! All of these would have been machined parts and expensive—now they are tube laser cut, even the channel, and done with relative ease. Tube Laser allows for parts to have slots, miters, complex angles, etc. and all done at one work station with the fast cutting people have learned to appreciate from laser technology. Tube lasers, obviously, are limited to cutting one stick of tube (or angle or channel) at a time. How does that stack up to saw cutting bundles of tube when comparing labor time? 1) The time it takes to ‘assemble’ the bundle. 2) The time and expense that is encountered when bundle pieces disassemble or flay about causing the saw blade to break. 3) The time it takes to deal with pieces that are not cut exactly right because the bundle isn’t cooperating perfectly. 4) The time it takes to deburr all the parts (normally left with a rough burr). 5) Here is a big, big one that most people forget or fail to recognize…the time it takes to manage downstream fit and weld issues because the parts are not cut squarely or are out of tolerance. Tube Laser technology has come a long way. We are not talking about a flat laser, meant to cut sheet metal, that has a tube cutting add on. We are talking about a dedicated sixty foot machine that is cycling through 20’ lengths of material in automated fashion. 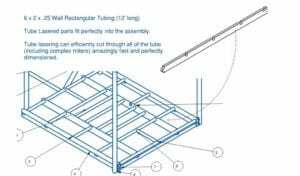 If the tube is square and the parts have no holes, miters or angle cuts, bundle cutting may still win, particularly if there are very large quantities. However, if you had any kind of miter or angle cut, or any kind of hole or slot, tube laser technology will prove significantly faster. 1) Tube Lasers eliminate the huge amounts of time consumed in multiple setups needed to saw, deburr, cope, fixture, drill. 2) Tube Lasers eliminate huge amounts of waste in material movement (from work center to work center). 3) Tube Lasers eliminate waste of space as piles of batch and queue parts can be removed from the shop floor. 4) Tube Lasers vastly improve the fit and weld time down stream because the parts are perfectly cut, +/- .01, which keeps fitters from struggling with alignment and welders from filling gaps (and fighting all the warping that comes from excess welding). This is a huge benefit! Even more, parts can be laser cut to fit into each other with tabs and slots making it virtually impossible for down stream quality errors. Even more, parts can be cut with etching, tabs and slots that make fixtures unnecessary. Bundle cutting may still have a car in the race but only on the rare exception. The first notion of anything beside square cuts and the Tube Laser will easily win the race. Call us or email for more information—the costs savings are real! 5-Axis Tube Lasers sound pretty cool but what does that actually mean? Pictures well help explain—hopefully a few sentences will help as well. Axis #1: Material is moved from Left to Right (or Right to Left) along the horizon, as it were, of the machine. Axis #2: Tube Laser Head is moved from Front to Back (or Back to Front) across the material like saw cutting across a two-by-four. Axis #3: Tube Laser Head is moved Up and Down (or Down and Up) above the material like a drill press moving up and down to drill. Axis #4: Tube Laser Head is Pivoting on a radius (or arc) on the same horizontal plane as Axis #1 like sketching an ark with a hand compass. Axis #5: Tube Laser Head is rotating on a 360 degree radius above the laser nozzle like an owl’s head so-to-speak. 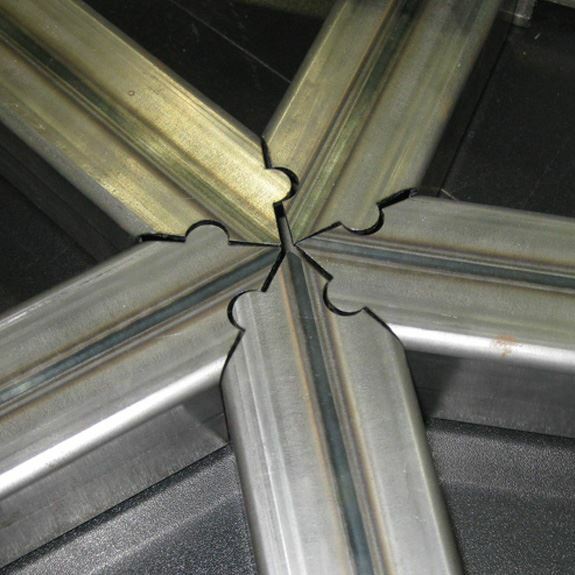 Ultimately, with all these axis operating simultaneously, the Tube Laser can cut a huge array of shapes and sizes with cutting surfaces that are normal and angle cut to the surface of the metal. For more information, we invite you to contact All Metals Fabrication at 801.392.9494 or info@allmetalsfab.com. What kinds of Material & Shapes will Tube Lasers Cut? 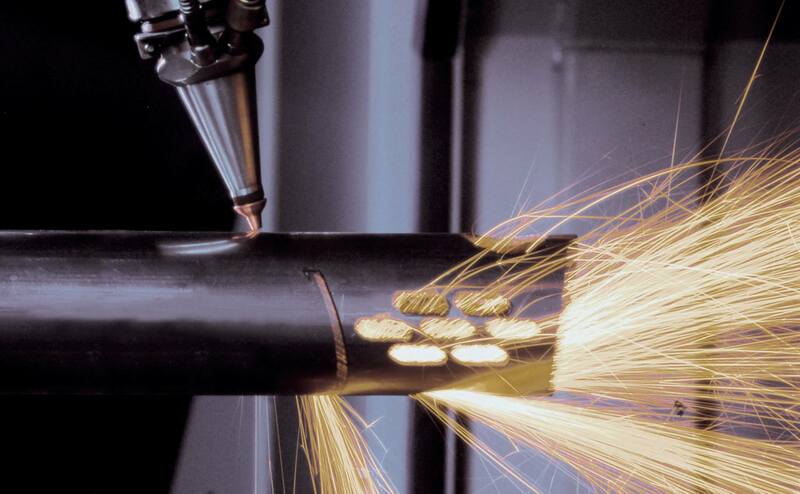 Much like flat sheet lasers, Tube Laser’s can cut Steel, Stainless Steel and Aluminum. Some are surprised to learn that tube lasers with 5-Axis cutting capacity, are well suited to cut Angle, Rectangular Shapes, Channel, Beam and, of course, round and square shaped tube. AMF’s tube laser, a Mazak 3D 220 Fabri Gear, is also equipped with tapping capacity for threaded holes and seam detection so the machine can cut the material knowing where the seam lies inside the tube. This extensive list of material types and shapes types gives AMF a wonderful amount of capacity. AMF’s machine allows for 25.5 feet of infeed and 20.0 feet of outfeed. It is capable of handling round shapes up to 8.66” OD and 6” x 6” Square. With auto loading and dedicated work space, AMF’s tube laser is set to chunk through vast amounts of material. The machine is hungry for work—give us a call to find out more about our great lead times and fantastic customer service. Tube lasers do battle with tradition fabrication methods very well! Sawing, deburring, coping, mitering, drilling are common fabrication processes, but one might question how tube lasers stack up against the likes of traditional machining centers. Frankly, the main issue when comparing a tube laser to a machine center is tolerance. Dedicated tube lasers are very good at holding tolerances in the +/- .01 range. The question potential tube laser customers should ask is what kind of tolerance is really required on my part. 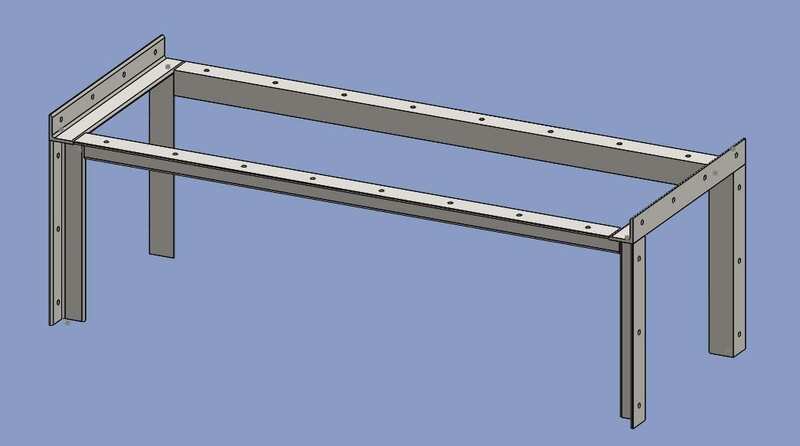 Engineers are generally good at designing fabricated parts at +/- .01 and machined parts at +/- .005 (or less) but many times those tolerances are more a result of the engineer’s drawing template then the part requirement. Drawing templates are infamous for creating unnecessarily expensive, high-toleranced, parts. Many of our customers save significant money by simply asking the engineer if the tolerances can be modified for certain parts that could be done on a tube laser which results in a substantial savings. This drawing is a good example. Saw cutting, machining to size and then tapping…verses stacking a 20’ length of tube into a tube laser and letting the machine go to work. In this example, because of the tolerance allocation, the tube laser will essentially replace three work centers and, obviously, will be much faster—both in processing time and material handling time. Dedicated Tube Lasers are leading edge technology that save people money. Find out more by contact AMF at 801.392.9494 or info@allmetalsfab.com. Continuous Improvement has been coined 6-Minutes by AMF. We are always looking for six minutes of improvement in one hour! Our Continuous Improvement team meets every week to discuss new ideas submitted and old ideas implemented! AMF specializes in Laser, Tube Laser, Water Jet, Forming, Welding and works with Steel, Stainless Steel and Aluminum. 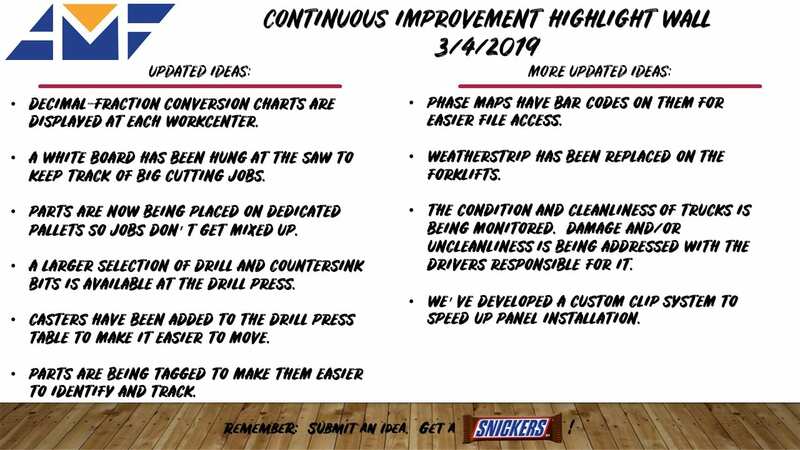 Check out our Continuous Improvement Blog coined The Wall, https://www.allmetalsfab.com/the-wall/, where we post about our improvement journey. We get better every day on purpose! Can Tube Lasers Cut C Channel? The answer is, again, a resounding YES! Just like Tube and Angle, Channel can be sliced, diced, notched, mitered, slotted, hole-patterned and cut with obscure shapes. These type of cuts, because of the Tube Laser’s ability to rotate the channel, combined with a 5-Axis beam head, can happen in the web or on the legs of the channel. 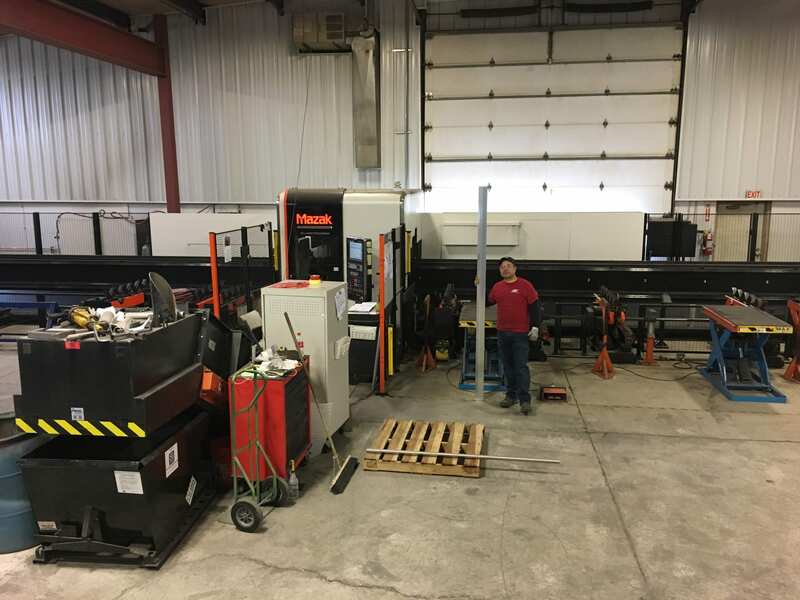 AMF boasts a fully loaded 60’ Tube Laser with cutting capacity to handle round tubing up to 8.6” and square or rectangular tubing up to 6”x6” square. AMF’s machine will load and off load lengths of tubing up to 25 feet. Finally, with 4000W of laser power, AMF’s tube laser can blast through steel wall up to .75” thick all the while holding tolerance in the +/- .01 range. AMF can cut steel, stainless steel and aluminum channel. 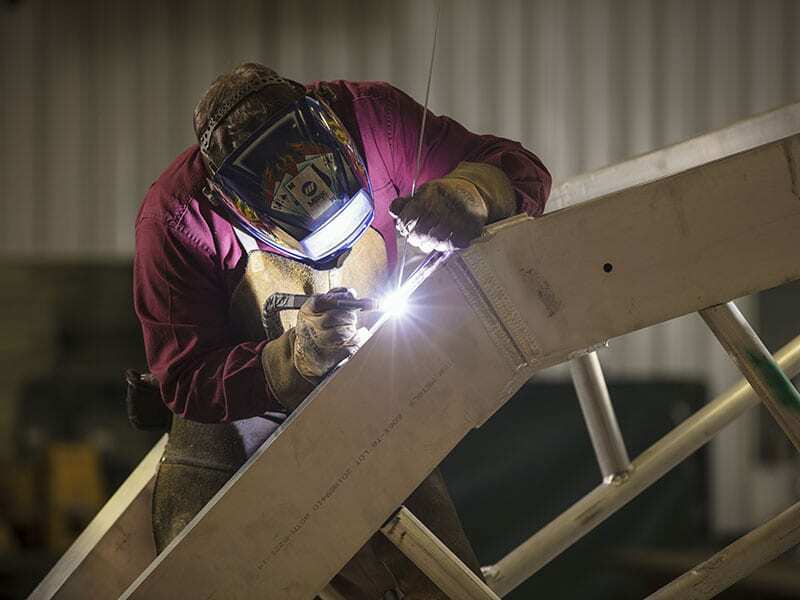 Our goal is to make fabrication easier than it has ever been. 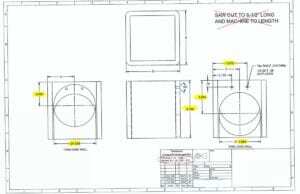 We work for other fab shops, OEM’s, contractors and any customer that has a CAD file and a Purchase Order. 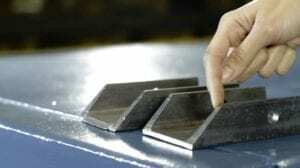 Does a Tube Laser cut Angle Iron? The answer is, yes, yes & yes. People are often surprised when we tell them that our 60’, 5 Axis Tube Laser will cut angle—steel angle, stainless angle & aluminum angle! TUBE LASERS cut angle with ease. Here is where IT GETS [MORE BETTER]—Tube Laser technology saves huge amounts of processing time! Parts can be cut with beveled edges, ready for welding. Parts are cut so accurately that fit up and welding are 30-50% faster. Tube Laser cutting is new technology and many people are still in the dark about what this machine can accomplish. Contact us at info@allmetalsfab.com and learn more today! Engineers are getting the idea of how to utilize dedicated tube laser technology. The parts and assemblies partially shown below are a wonderful example of how tube lasering can change engineering, design and assembly. Engineers should consider that 5 Axis cutting capacity, combined with the machines ability to handle 25’ lengths of material are completely possible. Those are game changing ideas when assemblies are considered. 6) Significantly decreased fit and welding time. 7) A better part for less money. AMF invites engineers to call or email and discuss what is possible with 5 axis tube lasering—it is a game changer! AMF has a fully functional 60’, 5-Axis Tube Laser that wants to EAT work for breakfast, lunch, dinner and midnight snacks! 1) Do you have any long lengths of Angle, Channel, Round, Rectangular or Square Tube that get cut regularly? 2) Do you have any lengths of angle, channel or tube or custom extrusion that get cut with one holes, slots, complex miters or angles? 3) Do you think stack cutting with a saw can beat the speed of a dedicated tube laser? 4) Have you considered the time wasted on fitting parts for weld that do not fit together perfectly? 5) Have you considered the time wasted on filling uneven gaps with weld? 6) Have you considered the time wasted on chamfering edges for weld prep? 7) Have you considered the time wasted on deburring saw cut angle, channel or tube? 8) Have you considered the time wasted on moving parts from work station to work station (saw, debur, drill)? 9) Have you considered the time wasted in queuing and stacking materials at multiple work stations? 10) Did you know our tube laser can tap holes? 11) Did you know our tube laser can cut up to 8.66” Round and 6×6 Square? SERIOUSLY, contact us to discuss these questions and you will be shocked about how dedicated tube laser 5 Axis technology can save you BIG money and VOLUMES of time.